Garmin Edge 605 designed for cyclists, features a sunlight readable, colour display and measures speed, distance, time, calories burned, altitude, climb and descent plus much more. Garmin Edge 605 comes with a built-in basemap, plus it has a microSD card slot for adding map detail including TOPO maps and street-level road maps. Easy to use - simple start-up, with no wheel sensors or calibration necessary. Garmin Edge 605 is easy to switch between bikes and includes a 15 hour battery life. Accessories, spares and parts are still available for your Edge 605. For the latest range of cycling GPS systems click here. Garmin Edge 605 GPS-enabled cycle computer comes loaded with everything you need to make the most out of your ride. Get cycle computer data and mapping detail, all from one compact, easy-to-use device. You can even store, analyse and share your stats for the world to see with Garmin’s online training community. With a sunlight readable, colour display clear and easy to read in all light conditions. Compact, lightweight and slim, yet robust and waterproof, the Garmin Edge 605 is ideal for all types of riding in all conditions. Lose yourself in the ride without losing your way. Garmin Edge 605 comes with a built-in basemap, plus it has a microSD card slot for adding map detail and storing workouts, courses and saved rides. Just plug in optional, detailed MapSource City Navigator street maps on a preloaded data card and get turn-by-turn directions on a sunlight-readable, colour display as you pedal. Add optional TOPO mapping for your off-road adventures. Garmin Edge 605 snaps easily into the included bike mount to guide you to your destination. The rugged Garmin Edge 605 automatically measures your speed, distance, time, calories burned and altitude. For even more detailed data, view the Garmin Edge 705, which can track your heart rate, cadence, power (from optional ANT+™-enabled third-party power meters), climb and descent. Both feature a high-sensitivity receiver that holds a signal under trees and near tall buildings and have a click stick for easy screen navigation. ‣Virtual Partner® lets you race a virtual competitor over a specified distance and speed. ‣Courses let you race against a previously recorded workout, so you can compare your current and past performances over the same ride. ‣Auto Pause® pauses the timer when you slow down or stop and resumes when you speed up again, so you can focus on your ride. ‣Auto Lap® automatically starts a new lap each time you pass a specified location or travel a preset distance. You rode hard and now you want to store and analyse your workout. With a simple connection to your computer, you can join a worldwide network of cyclists and outdoor enthusiasts through Garmin Connect™, a one-stop site for data analysis and sharing. Looking for accessories and spares for the Garmin Edge 605? View the full range here. 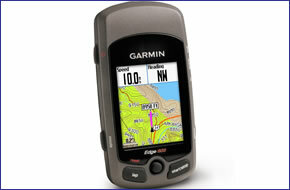 All parts are genuine Garmin product and specifically designed for use with the Garmin cycle GPS 605 device.